"I just have my iPhone 6s updated to iOS 11 and now it can't boot to its settings normally. It's stuck at Apple logo screen of death and becomes useless. I wonder how to fix my iPhone 6s stuck on white screen.. Help please." 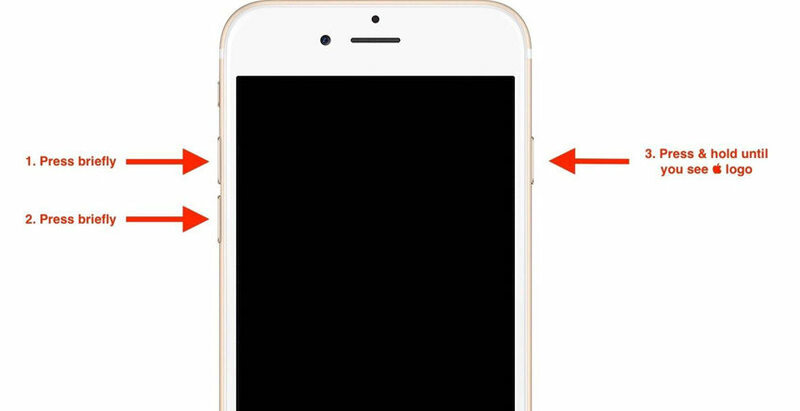 What Causes iPhone/iPad/iPod Touch Stuck at Apple Logo? After jailbreak, updating your iOS version or restoring from backup an iPhone/iPad/iPod Touch, your iOS device will probably spontaneously reboots and never boots past the Apple logo on black background. This is so-called iPhone/iPad/iPod Apple logo screen of death. And that's why your Apple iPhone frozen on white screen and iPad white Apple of death happens. Below we list 2 methods for you to fix iPhone X/8/8 Plus/7/7 Plus/SE/6s/6s Plus/6/6 Plus/ 5S/5C, iPad Pro 2, iPad mini 4/3, iPad Pro, iPad Air an iPod stuck on white/black apple logo. Method 1: Fix iPhone/iPad/iPod Touch Stuck in Apple Logo for Free with Tenorshare ReiBoot? Once if you find your iOS device stuck in white Apple logo of death, you can easily solve the problem by putting it into recovery mode. Here is a wonderful and free product for you – Tenorshare ReiBoot ( Tenorshare ReiBoot for Windows and Tenorshare ReiBoot for Mac), to fix it by entering and exiting recovery mode for iOS device with a single click. Moreover, it won't cause any data loss or damage for your iOS device. Firstly download and install Tenorshare ReiBoot on your computer. Step 1. Connect your device to your computer through a USB cable and run Tenorshare ReiBoot. Click "Enter Recovery Mode" in the interface. Step 2. Tenorshare ReiBoot will remind you that your iOS device is now in recovery mode. You can then start the restore process by clicking the "Restore" button in the iTunes window. Step 3. Finally, click "Exit Recovery Mode" to let your iDevice get back to its settings. Method 2: Fix iPhone/iPad/iPod Touch Stuck in Apple Logo by Repairing iOS? If Recovery Mode can't fix your iPhone stuck on white Apple logo, the most efficient way to save your iPhone, iPad is repairing the corrupted operating system on your device. ReiBoot thoughtfully offers you an easy way to repair operating system and fix all iOS stuck problems including Phone stuck on/during update, iPhone stuck on Apple logo, iTunes/red logo/boot/reboot loop/hello screen. Step 1.Run ReiBoot and connect your iOS device with the computer. Select "Fix All iOS Stuck" function on the main interface. Click “Fix Now” and follow the software wizard to get your device detected. Step 2. Download the firmware package to your computer. If you have downloaded the firmware, please choose "Import the Firmware Package Manually" to import it. Step 3. Once the firmware package is downloaded successfully. Click “Start Repair” to start system recovery. After repairing, you device will automatically reboot to normal. Thus, you have fixed iPhone/iPad/iPod Touch stuck at Apple logo. Never to worry about fixing iPhone stuck in white Apple logo of death again. Simply get this iOS system restore tool to fix system-related files missing or corrupted during iOS 11.3/11.2/11/10 upgrade, jailbreak, or restore.